When Uber introduced ratings to its rideshare platform, it transformed the transportation industry. Ratings in the Uber app help enable high-quality experiences for both those behind the wheel and in the back seat. Today, Uber Freight is bringing that same transformative power to the trucking industry with the introduction of Facility Ratings. 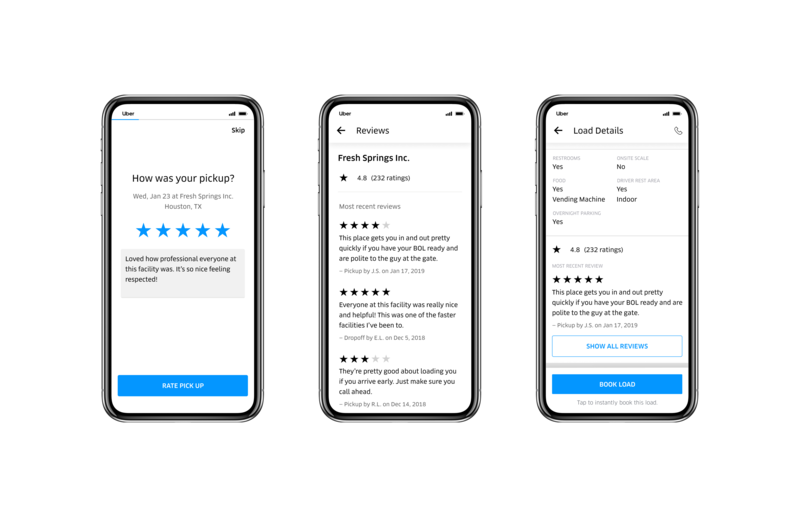 A new function within the Uber Freight app, Facility Ratings empowers carriers and their drivers with the ability to share honest feedback about the facilities they visit. It also gives shippers the insights they need to make positive change and improve driver experiences. Truck drivers spend a lot of time at facilities. It’s where they go to pick up and drop off their freight shipments, and often where they spend the night after a long day of driving. Detention time, bathroom access, and parking availability are all factors that either incentivize or discourage drivers from choosing loads at a given facility. These issues are more important than many realize. According to a survey of 150 trucking companies in 2018, 80 percent of carrier respondents refused to take loads from facilities for reasons including inflexible appointment hours and lengthy detention times, which the US Department of Transportation (DOT) estimates costs truckers a total of $1.1 to $1.3 billion in earnings each year. Despite the amount of time drivers spend at facilities, they don’t always have the opportunity to share their experiences with those who have the power to improve it. Uber Freight’s Facility Ratings change this. The new feature allows carriers and their drivers to rate facilities on a scale of 1 to 5, with the option to leave a written review. These ratings, along with details about a facility’s amenities are available to all Uber Freight users. For example, when drivers are deciding whether or not to book a load, information around bathrooms, parking, on-site scales, and more will be available at their fingertips. This information is key in helping carriers choose the right load for their needs. It also enables a feedback loop between carriers, drivers, and shippers, allowing for more collaboration and improvement across the freight industry. For shippers, each facility is a critical piece of their overall supply chain operations. These supply chains are often large, complex, and fragmented, making it difficult for shippers to identify inefficiencies and areas for improvement. 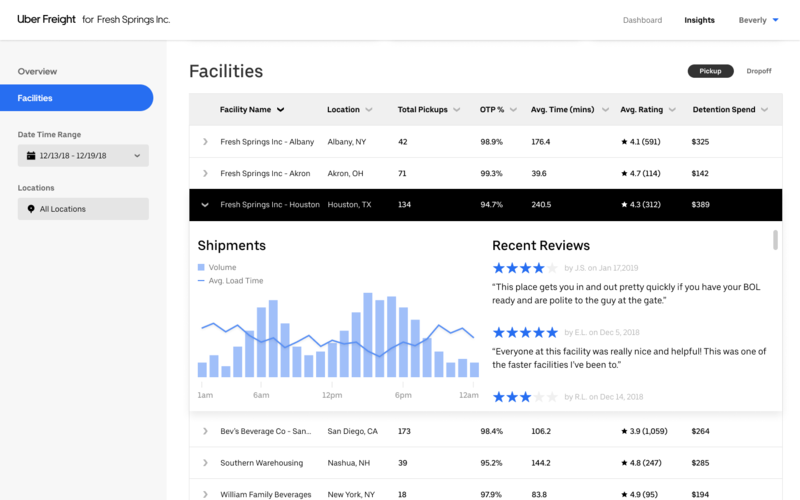 With Uber Freight’s Facility Ratings, shippers can see feedback to better identify where and how to improve facilities and the driver experience. Facility Ratings data can be accessed in the shipper platform, helping shippers to both quantitatively and qualitatively assess a facility based on feedback from drivers. This data allows them to identify areas of improvement and make informed changes to their operations. By giving drivers the opportunity to share feedback and giving shippers the ability to use that feedback to address driver pain points and inefficiencies, Uber Freight’s Facility Ratings help create a more transparent environment—both now and in the future—for the entire logistics industry. When shippers and carriers work more closely together, everyone benefits. Facility Ratings is available to all users in the carrier app and will roll out to shippers via the shipper platform in the coming weeks. To sign up, visit here.